The morning sun finally peeked over the cliff wall. I was happy to see it, and especially happy to feel its warmth, after having spent a long, cold night marinating in the frosty desert air. About a minute after the sun came over the cliff wall, one of our guides walked into the area where our small group of 11 students was scattered about on the ground sleeping among the juniper trees and prickly pears. “Wakey, wakey,” he said in a cheery voice. Thus dawned day two of Boulder Outdoor Survival School, a primitive survival school held in the deserts and mountains outside of Boulder, Utah inside the boundaries of Grand Staircase-Escalante National Monument. BOSS is the oldest outdoor survival school in the United States. It’s been in operation since 1968. 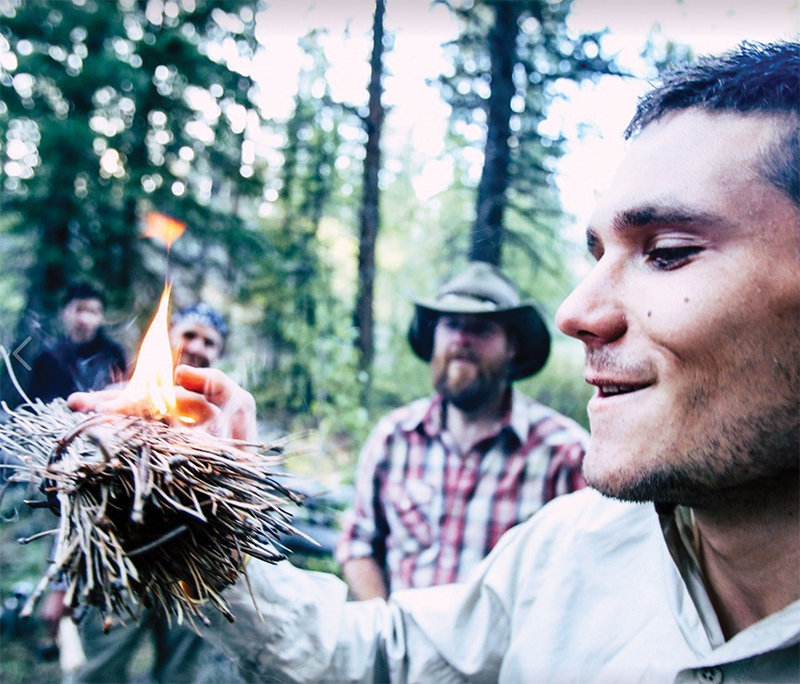 Students learn map and compass navigation, how to build a bow and drill firestarter and, just as importantly, how to use it to make a fire. The survival students learn how to build a shelter, and what area plants are edible and medicinal. Most important of all, the classroom takes place outside allowing students to interact intimately with their environment. All the lessons are hands-on. The class is mobile. Students will hike six to 15 miles per day. BOSS offers one-, two- and four-week field courses. I did the two-week course. I was one of eight students and three leaders. During the first three days of the course, we carried only a knife, a fanny pack with journal, camera and sunscreen and the clothes on our backs. We had no tents, sleeping bags, backpacks, canteen or food. The purpose of such minimalism was to allow us to experience nature on its terms without any shells between us and it. I put on my boots and stood up, a bit stiff and sore after yesterday’s eight-mile hike. Some of my fellow students also showed some signs of having spent a day hiking through the desert and sleeping under the stars. It appears that yesterday’s sun found a chink in Ted’s armor of sunscreen. He now has three sunburned finger lines across his forehead that look like russet streaks of warpaint. Sheila has a constellation of mosquito bites across her forehead and down one side of her face, and nearly all of us had scratches on our shins from walking through fields of sagebrush. We didn’t stay long in our camp among the junipers because any chance we had of finding food and water was on the trail. Mike, one of our instructors, led the way out of camp. We hadn't had water since early the night before so finding water was our primary priority. The terrain gradually declined and transitioned from juniper and pinyon trees to sparser vegetation: Brigham tea, rabbitbrush, manzanita bushes, white oak trees. Interspersed among the vegetation, we passed foot-high volcanoes of gravel and sand erupting red ants. Black, green and rust-colored lichen covered flat gray rocks in a blotchy, papier-mache rash. Semi-transparent, semi-hardened sap dripped down the bark of a wounded pinyon tree in a lacy, yellowish curtain. In other places, the sap hung from branches in amber icicles. Below, were puddly amber stalagmites. Two hours after leaving camp, we reached a redrock promontory named Impossible Peak. Impossible Peak was a 400-foot high sandstone peninsula surrounded by a sea of sand and sandstone. From atop the sandstone catwalk, we could see a green vein in the desert floor below us, which we deeply hoped meant we’d find a stream there. We descended the side of the promontory, switchbacking across a series of narrow ledges like typewriter keys moving down the page. Near the bottom of the peninsula, the trail ended at the cliff's edge and began again 30 feet below us. A rope, anchored into nearby rocks, hung from our position to the trail below us. We had no rapelling gear. The plan was to climb down the rope hand over hand with our feet planted against the cliff wall. In addition, the person climbing down the cliff tied a second rope around their torso and our instructor, with his feet braced against some rocks, acted as belay. I was the third one off the cliff. I attached the belay rope around my torso, took hold of the other rope and backed off the cliff’s edge and walked backwards down the cliff face. After I reached the trail below, I untied the belay rope and joined Liz and Steven in a small patch of shade beneath a juniper to escape the baking July sun, which was now directly overhead, while we waited for the rest of the group to make it off the cliff. It took nearly an hour for all of us to make it safely off the cliff. From there, the terrain slowly softened into foothills. Mike led us closer to the green vein at the bottom of the desert. The sun sneered, leaned into us with its full weight, like Shiva, Hindu God of Destruction, leaning on us with his four elbows. The sun only lacked some inwardly slanting eyebrows to show its ferocity. The temperature was in the low hundreds. It had been 20 hours since our last drink of water. Mike led us toward the band of cottonwoods, willows and grasses we had seen earlier from the cliff top. The air grew humid and smelled of decomposition as we stepped into the green belt and then, there it was: water. The streambed that ran through the willows, reeds and grasses was no wider than a ditch and the water in it was swampy and brackish. It looked more like something you’d find in a Detroit gutter. On the hills away from the stream’s swampy heart junipers, pinyons and cottonwoods cast their shade. We dropped our fanny packs among their shade and pushed into the willows to find a place where we could access the water. Sheila Heyns, a 25-year-old woman from Chicago, skimmed some moss off the sluggish stream and dipped in her cup. I dipped in my cup after her. No matter how carefully I skimmed, it was impossible to screen away the moss and dead bugs. I dripped in some purification drops and found some shade. The water smelled swampy. I drank a sip as a taste test. Ick! I winced it down. It was thick with thrummy moss. It was like drinking shag carpet and tasted like sweaty socks. Now, I know in a situation like this, after having hiked through the desert for 20 hours without a drink I'm supposed to say that it's the best water I've ever had; but it wasn't. It was some of the nastiest crud to ever cross my lips. One of our instructors Josh Bernstein held his cup aloft as if giving a toast and said, “Ya gotta make dew with what you have, ha ha!” and gulped down his water. Despite the water's nastiness, it was the only water available in a hot summer desert and we were all severely dehydrated. We were advised by our leaders to drink as much as we could before we moved on because it was likely going to be a while before we came to more water, and we still had a lot of desert to cross. We plunged in our Sierra cups four or five times and drank till we had satisfied our insistent thirst. Having done that, our thoughts turned to food. Our last meal had been 30 hours ago. We scanned the terrain for edibles. Not knowing what might or night not be edible we watched our instructors to see what they did. Mike overturned a rotting log and on its underside found ants and ant larvae. To our surprise, he picked up some larvae and eating them! “Try some,” he said. Then he started eating the ants. We tried some. The ants, which were black, tasted strangely like chlorine, and crunched like a pinyon nut in its shell. Hesitantly, Lee, a 26-year-old mountain bike shop owner from Boulder, Colo., tried an ant larva. "They taste pretty good," he said. "They kind of taste like almonds," said Sheila. And they did. The taste wasn’t bad but the texture of a squishy, wiggling creature was hard to get used to. We ate ants and ant larvae for about 15 minutes and then moved on. The trail Mike led us down moved eastward, then made a slow curve till we were traveling north. Cliff walls bordered us on the right and left. To my left, from the west, I noticed thick cumulonimbus thunderheads moving towards us. A lizard ran across the Navajo sandstone, sporadic as a butterfly's shadow. Locusts took short flights from the junipers and sagebrush, their ratchety wings sounded like playing cards stuck in bicycle spokes. Overhead, thunderclouds rumbled, nearly as loud as our empty stomachs. In the early afternoon, the dark clouds crumbled. The raindrops, which left freckles the size of quarters on the sandstone over which we walked, evaporated off the hot rocks almost as soon as they hit. We took shelter under a stand of river birch trees during the heaviest part of the storm, tucking back in as close to their bases as possible. The rain didn't quit but lessened enough for Mike to feel comfortable enough to leave our meager shelter and head out again. The canyon walls, which towered several hundred feet above us, grew narrower until they closed together. Our only choice was to start climbing up them. We followed an old prospector's mule trail climbing ledge to ledge, following cairns as tall as snowmen, past ancient prickly pears with racks of pads as big as moose antlers. We came upon a yucca plant with some ripe fruit and some of us picked the fruit and ate it. It tasted like bitter peas. I was hot and tired. I was dehydrated. In the last 40 hours, I had eaten only a few ants, larvae and yucca fruit. The sun, which ripened my enthusiasm this morning had been depleting it for the last two hours. Our little group hiked along like tired mules who have been carrying fat tourists out of the Grand Canyon. And our curiosity had faded with our energy. Our eyes no longer darted to the scenery ahead or beside us, but focused only on the trail, the next step. Our thoughts turned inward. I wondered when we’d stop for the night. I wondered if we were going to find more water. The wind blowing through the trees sounded like running water to me. The trail semed endless. Our combined energies, which before were bright and green and leafy and succulent were now shrunken into skinny, brittle, dry sticks, silhouetted against the immense desert sunset like a fall orchard. Camp, with its promise of rest, seemed just ahead, but evaporated as we came around the corner, crested the ridge. A mirage! But it was my intense thirst that cast the largest shadow over everything. And there was a few seconds while switchbacking up the cliff wall where I thought I was on the verge of passing out. It happened when we made a rest stop. 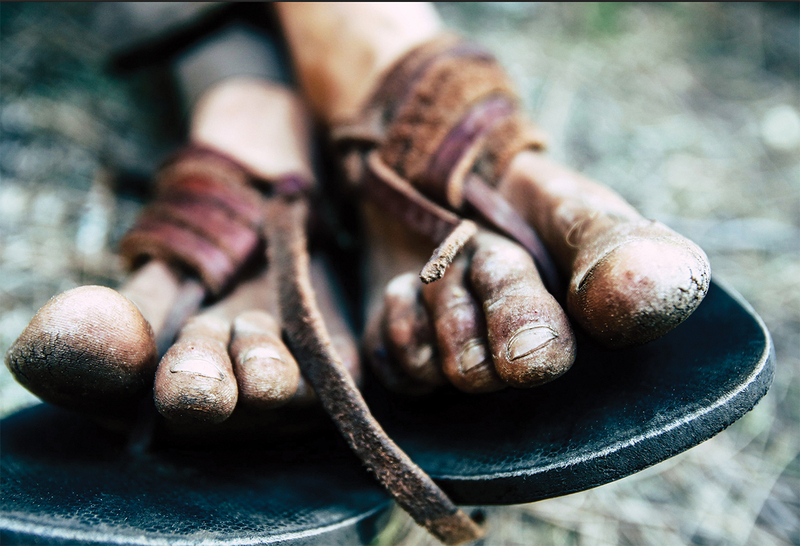 My legs felt tingly, a feeling like dozens of ants were crawling up and down them. I put my hands on my knees to rest and let the feeling pass and while doing that noticed that dozens of ants were crawling up and down my legs. I picked them off and start eating them. It was, after all, a survival camp. On the mesa top we found rain water in a pot hole. The pot hole was covered with a pudding skin of dust and fine debris. It was swimming with larvae, floating with the dead husks of wasps, beetles, ants. We filtered the debris out with bandannas, added some purification drops. The bandana-filtered water was clear but tasted like a hippie’s bath water. It tasted awful, but I was so thirsty, I happily gulped down six cups of it. Finally we reached the top of Dry Bench and made camp under a large stand of Ponderosa pines. There wasn’t much involved in setting up camp. We didn't have any tents to pitch, didn't have anything with which to build a fire, there was no food to prepare. Our elevation was fairly high, 8,600 feet, so even though it was July it would get plenty cold tonight. Our instructors showed us how to insulate ourselves from the cold ground by creating a mattress of pine needles and fallen leaves. The thicker the better. We watched the last of the sunset catch on top of the distant cliff walls like the hem of a dress dragging across the top step of a staircase, and watched the pine trees become silhouettes. Just as the first stars began to appear in the eastern sky, I laid back on my pine needle mattress. My heavy eyelids snapped shut like the jaws of a bear trap. BOSS offers one-, two- and four-week desert survival courses. During their time at the field school students will learn how to build a fire using only a bow and drill. They’ll also learn how to make the bow and drill using the raw materials they find in the desert. They’ll learn where to look for water, how to navigate across open terrain using a map and compass, how to build shelter, how to nap and shape flint into useful blades. There is something very empowering about learning those skills. Even though they’re skills I don’t use on a daily basis I found that they gave me a great level of confidence that I carried with me in my daily life. A year after my time at BOSS I contacted many of the friends who had taken the course with me and they all expressed that they too felt a level of confidence and empowerment they didn’t have before. I went on to use the skills I had learned at BOSS many times in the future. 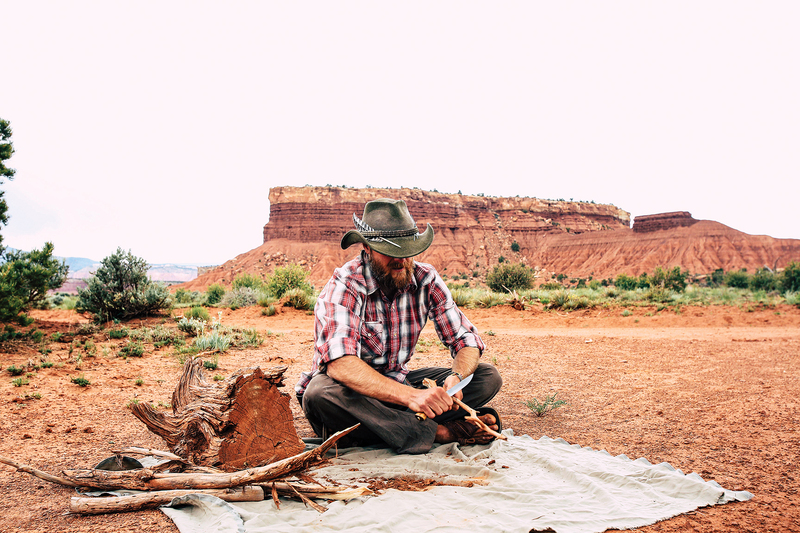 It gave me the confidence to go on deeper trips into the backcountry of the Colorado Plateau. My longest was a 40 day solo trip into the Dark Canyon wilderness area. Those deep excursions opened a gateway to my soul that revealed all sorts of interesting results and experiences, experiences I wouldn’t have had without the confidence and knowledge that my two weeks at BOSS gave me. My favorite part about my days at BOSS was tramping through the desert with my little tribe of 16 people, out in the sun, the wind, the rain. Sleeping on a mat of pine needles, drinking water straight from the stream, interacting with nature on a deep, intimate level. Slickrock, seeds and searching for the wild.